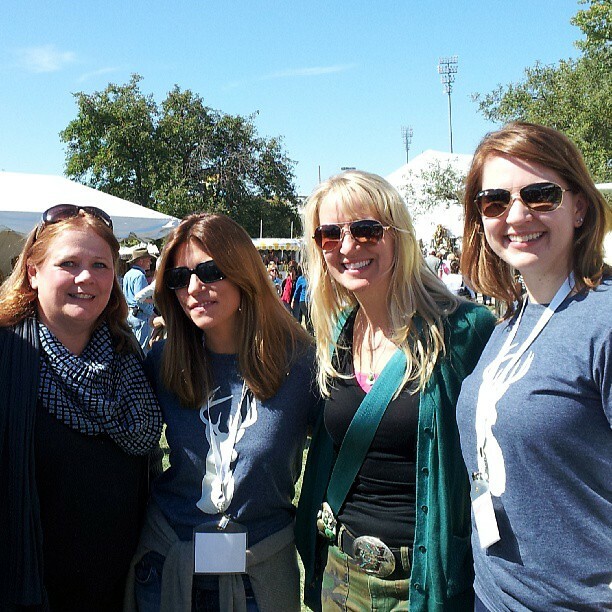 I had a blast at the Country Living Fair this weekend. I went on Friday with my niece and did a ton o’ shopping. BTW, new shoes and walking all over the fair do not make for happy feet. Oh, and if you are going to sit on a hay bale to eat lunch, make sure it’s not wet. I don’t need any help with looking like I may have peed my pants, thank you! I’m all about the obvious tips, aren’t I. Then I went back on Saturday for a bit to meet up with some other bloggers and to meet the Editor of Country Living (!!! ), Sarah Gray Miller, along with Rachel DeSchepper, the magazine’s Senior Web Editor, and Cari Cucksey from HGTV’s Cash and Cari. I took my big girl camera with me, but it was just so darn busy and crowded that I didn’t get any good photos with it and finally just tucked it back in my backpack and turned to my trusty cell phone for photos. Here are some of the pics I shared on Instagram, Facebook and Twitter. I bought none of this stuff, but I wanted that tractor grill so badly that I had dreams about it on Friday night. Now, I actually bought more than what I am about to show you. But someone who reads this blog, that I am related to, will be getting a care package from me in a few weeks and I didn’t want to spoil the surprises by posting photos here. So, it’s basically my sister’s fault that I’m not showing more of my haul from the fair. Blame her. 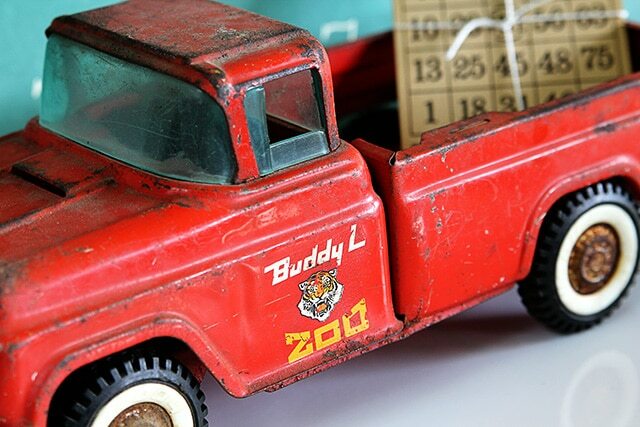 This Buddy L zoo truck is my new baby. I haven’t named her yet, but I am picturing her on my dining room table during the holidays with some Christmas trees stuck in the bed. I may have to steal a camel or two out of my nativity set to use as “zoo” animals. I also bought a bunch of Bingo cards and a penmanship chart that looks like it’s written on a green chalkboard. I love any kind of chalkboard, but green is my favorite. BTW, no wild turkey legs at the fair. Not sure why they weren’t up on that breaking trend. How was your thrifting weekend? Did you score anything cool? Anything weird? Previous Post: « Yard Sale Oddities? I like your new truck. Wish I would have gone to the Home Talk. Love Cari. Still hoping someone posts those spice and tin characers. Are you going to Springfield this week-end. I am still sorta grounded. Cute truck. I’m glad we got to spend some time together. I ended up hitting the broom booth before we left and bought a little whisk broom for my kitchen. I love Buddy the truck. That is way cute! Well, I didn’t have a thrifting weekend, but I did have a flea-market DAY w/ my sister. My husband got it in his head that we need a bench at the foot of our bed. One of the first booths that we stopped at had a wooden bench for $5. I think I will paint it to freshen it up. I’m happy w/ my find!!! Glad you had fun, Pam! We won passes to the fair and went on Saturday. I was disappointed by the lack of funnel cake and/or fritters. The fair was great fun, though. I loved the duet playing at the corner near the church as much as any other part of the fair. We perused the museum for a bit as well, which was really neat. I have wanted to go for so many years, it’s kind of funny that I only bought one thing at the whole fair. Well, one non-food thing. And that was a glass frog for $3, which will sort of precariously fit atop a wide mouth Mason jar and hold flowers. I think we are spoiled with places like Decor Steals and Antique Farmhouse, Etsy, Artfire, etc. We have access to all sorts of great stuff all the time, and not just at special events like these. Still, I’m thrilled to say I got to go and see it. Plus, we met some fantastic people. Shades of second grade. 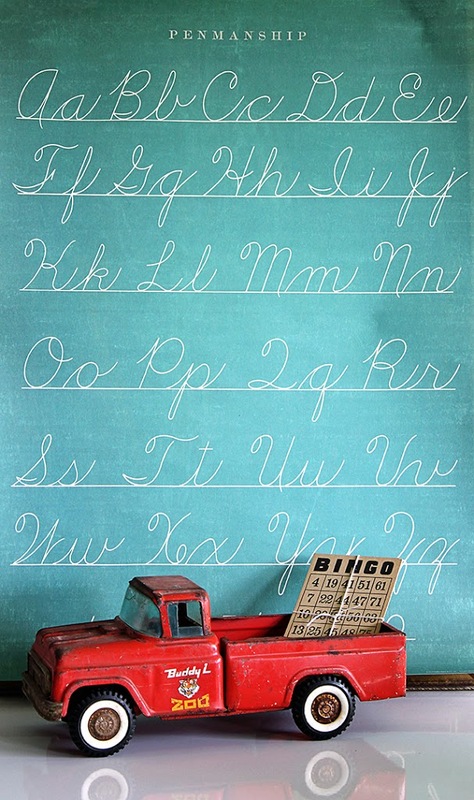 Our penmanship charts were white on black paper, of course. The really olden days. I know Buddy L will be working overtime hauling all kinds of fun junk around. Looks like you had a fabulous time, aching feet and all. Your little red truck will look so cute at Christmas! Love the handwriting chalk board! You look like you had a lovely time. The truck and chalkboard are awesome. I haven’t been thrifting in forever- I am forbidden to bring anything else home until I dump some of the “I haves” at my house! LOVE the truck and you girls all look like you are having a ball there. Green with envy over the red truck. The penmanship chart? When I first started teaching I had one of those! You deserve every single moment of happiness from last weekend’s shopping adventures. Awesome picture of you and the gang. That red truck is going to be fabulous at Christmas with a load of bottle brush trees. I’m terribly addicted to bingo cards. I have them in stacks in the craft room. Can’t wait to see more pics. I hope you blew that picture up to a life size image and hung it over your sofa! You go girl! Love your truck! I bet you had a blast and I’m so envious that you live close enough to attend such a fun event. Sounds like the most fun, Pam! Love all of your finds and it must have been great meeting everyone! LOVE that last photo…pure eye candy! Love the photo of you and your new BFF’s. I agree–green chalkboards are the best and I love that truck! I wish I would plan my year better. I have TONS of family in Cbus and I have NEVER been to this fair. Pam, LOVE LOVE LOVE this post. Going to the Country Living Fair is on my bucket list!!! BTW: I put your fall wreath on my FB page today. I am going to make one! I think it is absolutely ADORABLE! 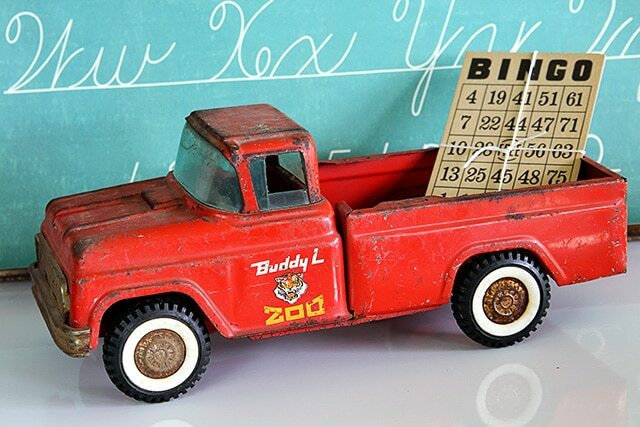 Love your new Buddy zoo truck and your chalk board. Love that tractor grill- too bad you didn’t bring it home. Love your finds! I had a great time junkin Saturday morning. Got an old jug cooler, a backgammon set in leather case and some other goodies. LOVE the Country Living fair! I can’t wait til next month when they’re here in Georgia – will be my third trip! Love your finds! What a fun way to spend the weekend!! You’re looking good with your new BFF’s. Love that penmanship chart! I adore your new truck! What a find! I’d name him Zippy – just for fun LOL. I LOVE that little red truck, I have been looking all over for one of those. You found some wonderful little treasures, didn’t you. Wow, how cool it must have been to spend time with them. Love your finds, too. Especially the penmanship board. That little vintage truck is really hot! We’ll be tweaking our finished basement (man cave) for hubs and he wants to do it with a vintage car theme for the accessories. How cool to go to the Country Living Fair, some day I hope to go. Thanks for sharing at Knick of Time Tuesday, Pam!